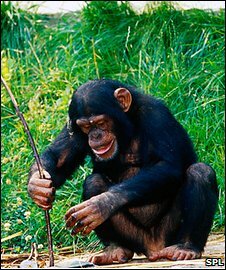 Copycat chimps build their own tools after watching video demonstrations. During a study, the animals were shown footage of a trained chimp combining two components to construct a tool that enabled it to reach a food reward. When given the same two components, the chimps made their own tools and used them to drag over a tasty treat. Reporting in the Royal Society journal Proceedings B, scientists say this demonstrates what a "potent effect" social learning has in the primates. Elizabeth Price, from the University of St Andrews in Scotland, led the research. "With video, we can control exactly how much information the animals see, so we can understand exactly how much information they need to work out how to do the task," she explained. Dr Price and her colleagues put the chimps into five groups during the test. 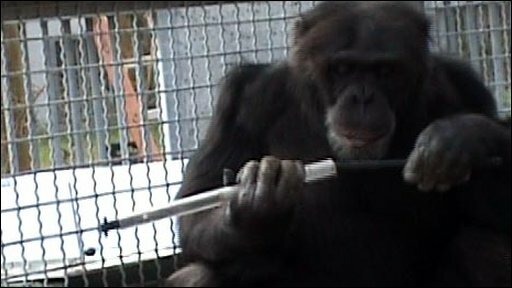 One of the groups was shown the whole demonstration - where a chimp was handed a rod and a tube that it slotted together. The demonstrator then used this longer composite tool to retrieve a grape from a platform outside its cage. The other groups were shown progressively less information - with one group just shown the chimp eating its grape. The researchers then recreated the set-up for the subjects. They placed a grape on a platform against the outside of each chimp's cage, and handed the animals a rod and a plastic tube. "Those chimps that saw the full demonstration learned better how to construct the necessary tool (to reach the food)," Dr Price told BBC News. "The fact that they can learn how to build a better tool for a particular task is very exciting. This type of behaviour is very rare in the wild, and it's an essential part of human tool use." "A handful of the chimps that weren't shown the full demonstration learned how to make the tool on their own," said Dr Price. "What was interesting about this group was that, when we presented them with the grape at different distances from the cage, they made the appropriate tool to reach it." Rather than faithfully copy the demonstration, these animals switched between using the unmodified tube or rod, and using the combined tool, depending on how far away the grape was. "Those that had been shown the full demonstration, and had socially learned to make the longer tool, continued to make it even when the grape was so close that it was more awkward to use," said Dr Price. "It could be that social learning is such a strong force for the chimps that they apply a blanket rule of 'go with what you've seen' (rather than work out what's most appropriate for the task)." The team is now planning to carry out the same test in young children to find out how much they rely on social learning. What the team still do not know why this type of tool-building is not seen more commonly in the wild. "We've shown that they're clever enough, so there must be something else at play," said Dr Price. "It may be that when chimpanzees reach an age at which they are... capable of performing these higher level techniques, they may be too old to have access to sufficiently tolerant demonstrators."